What is an ‘intact forest’? An intact forest is one that is free from industrial activities (e.g. logging, mining, roads, power lines, etc.) and is considered large enough to sustain viable populations of native species like wolves and cougars. In 2003, a study by Global Forest Watch Canada revealed that Clayoquot Sound contains the largest intact forest remaining on Vancouver Island and the Lower Mainland of British Columbia — a region that has been devastated by logging for more than 150 years. 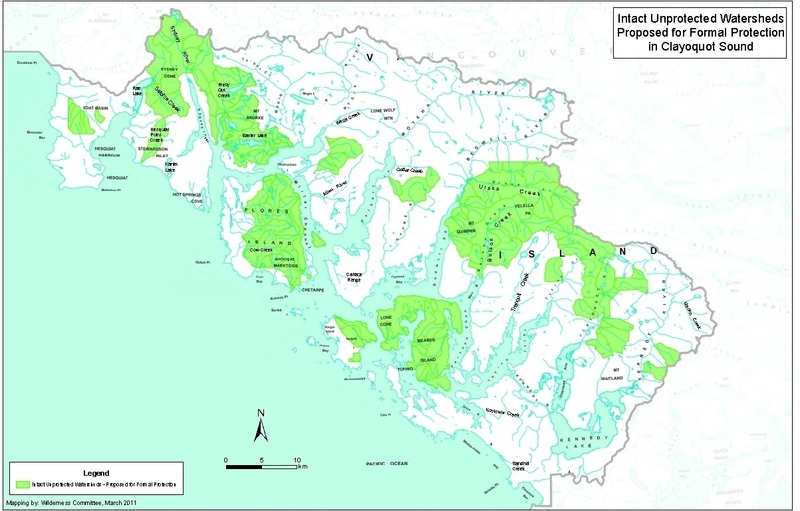 Clayoquot Sound has long been known to contain one of the most spectacular forests on Vancouver Island, but this research confirms both the uniqueness and the critical importance of Clayoquot’s rainforest to the native biodiversity of the entire Island. The heart of Clayoquot’s intact forest is composed of a series of undisturbed or “intact/pristine” valleys. Large valleys like the Sydney, Pretty Girl, Ursus and the Upper Bulson stand majestically as they have for thousands of years, and are cradled by smaller but equally important stretches of wilderness like Satchie and Hesquiat Lake Creeks. In the ocean channels lie impressive islands cloaked in old-growth forest, like Flores and Meares Islands. Together, these intact islands and valleys offer native wildlife on Vancouver Island its best chance to survive and thrive for countless generations to come. But only two large intact valleys are protected in their entirety (Megin and Moyeha Rivers, in Strathcona Provincial Park). Friends of Clayoquot Sound, in alliance with other environmental groups, are working to attain permanent protection for all of Clayoquot’s unprotected intact valleys and islands (74,000 hectares). For more info about Clayoquot’s intact valleys (below), see this page.